While live streaming my church’s sermon in our living room this morning — yes, that’s right, we didn’t make it to church, tsk, tsk — I found myself having a hard time concentrating on the pastor’s words of wisdom. Why? I was fixated on the accumulated dust and cat hair underneath the arm chair across the room. After the sermon was over, I got out the broom and dustpan and went to work. This incident struck me as funny. Here I was, on my hands and knees, still wearing my bathrobe, scraping out months worth of dirt from underneath the chair. Then, suddenly it seemed very profound. What if we are blocked from fully hearing and absorbing God’s truth if there’s accumulated “dirt” in our lives? If there’s sin we are intentionally harboring or ignoring, does that make it harder for us to hear and be changed by good teaching? Or, on the other hand, what if hearing good teaching is what illuminates the dust under the sofa? Recently, I went through a period of intense self-focus. My eyes were trained on needs that weren't being met how I thought they should be, and I was ignoring little blessings that otherwise would have jumped out at me. Like how God was providing for me. How I had so much to be grateful for. I was also ignoring truths I was hearing that could have helped me course-correct. Through the teaching of the Word and through the counsel of wise people God sent my way, I started seeing that dirt under my sofa. He shone a brilliant light on it, and he gave me a broom to sweep it away. I pray for the light to always shine on the dirt in my life. I pray I will stay willing to be made new. 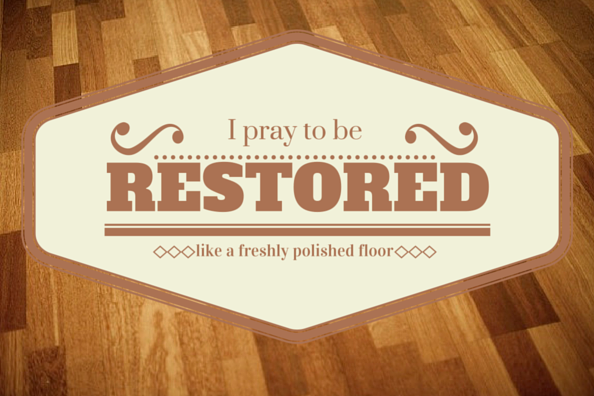 I pray to be restored like a freshly polished floor. Poem: "A Prayer for My Anxious Cat"